18” x 24” Signed artist's print from original watercolor art. Napa Valley is one of the most famous wine regions in the world. It's also known for its great food with its many Michelin star restaurants. Napa has a variety of terrains and weather climates, leading to the production of a variety of great wines. Among the internationally acclaimed varietals produced in this region are Cabernet Sauvignon, Merlot, Zinfandel and Meritage blends based on Bordeaux varietals. Napa also offers a number of other varietals, including Pinot Noir, Chardonnay, Sauvignon Blanc, Syrah, and Cabernet Franc. With about 500 wineries in Napa, it's impossible to visit them all, but I have highlighted some of my favorites along with a number of iconic ones, including some of the world's best Cabernet Sauvignon producers. 18" x 24" Signed artists print from original watercolor art. Paso Robles is an exciting and diverse wine region located halfway between Los Angeles and San Francisco in the heart of the Central Coast region of California. It's one of the state's fastest growing regions and has become known for some excellent wines at affordable prices and for the great hospitality from the locally-owned wineries. The area is highly regarded for a wide variety of wines, especially it's "GSM" varieties, a blend of Grenache, Syrah and Montverde grapes. But you can find many other varietals including Zinfandel, Rose, Chardonnay, Cabernet, and Pinot Noir. Paso Robles is a great town to visit, with excellent accommodations, some at the wineries, and very good farm-to-table restaurants. There are over 150 wineries, many with tasting rooms where visitors are welcome, and the cost of tasting is modest. Paso Robles reminds me of Napa and Sonoma twenty years ago before the prices soared. The Paso Robles and Edna Valley regions, 37 miles south, comprise the wine regions of San Luis Obispo. 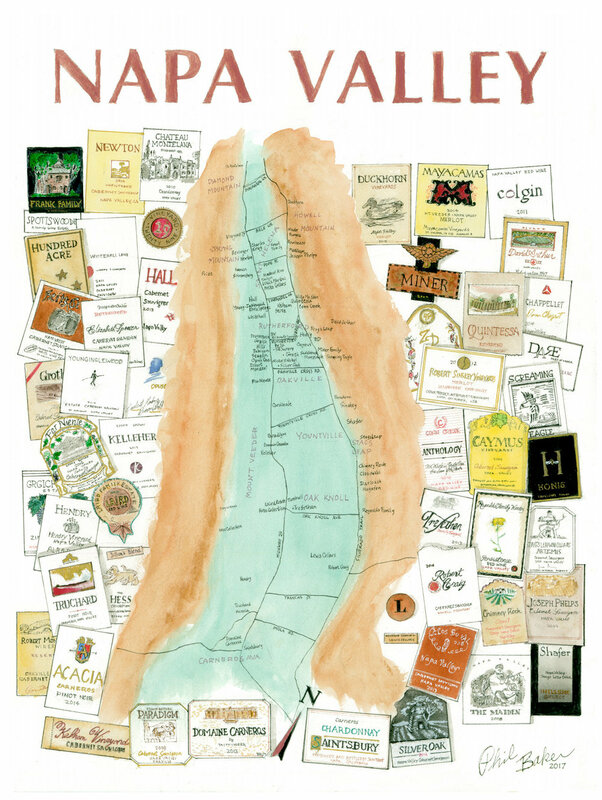 Edna Valley offers equally excellent wines and is included on the map. As part of my "research" for creating this map, I made several trips, sampled, and featured my favorite on the map. 18" x 24" Signed artist's print from original watercolor art.